Same great formula now with 2 more enzymes. Ultra-Enzyme Support ® may be the most complete way to support your body on an enzymatic level. Now with 19 Enzymes for a complete digestion support. NEW Lactase – Helping digest, Lactose,digest yogurt, milk products and cheese. Tired of gas, bloating, and digestion problems? Our Digestive Enzyme formula is the best all natural plant based supplement for a complete digestive health and nutrient absorption. Most food intolerance do not even involve the Immune System, though gluten intolerance is a notable exception. We have extra enzymes for people with gluten sensitivity(not celiac disease) . Common symptoms of gluten sensitivity include abdominal pain, gas, fatigue, headaches, “foggy mind” or tingling of the extremities. The most well-known food intolerance is lactose intolerance, which is caused by the body’s inability to break down the milk sugar lactose. We have added more enzymes for this very purpose. Special Enzyme Blend-a proprietary blend of protease and lactase enzymes used to further enhance the digestion of dairy products. It is included to meet the special needs of people who suffer from lactose intolerance. n·zimes PA-L™ is a proprietary enzyme blend that is included as an alternative to animal based pancreatin enzymes. It is isolated from plant sources to further increase the body's ability to metabolize proteins, carbohydrates and fats. It is ideal for diets high in saturated fats. NEW Lactase – Helping digest, Lactose and milk sugars. Lactase is required to break down lactose (a primary sugar found in mammalian milk). Also used to help digest yogurt, milk products and cheese. You can also try Belly-Ease it is the same full formula in a chewable. Live Enzyme Activated Delivery System ® (L.E.A.D.S. ®) insures assimilation at a cellular level. This particular combination of ineral cofactors helps to activate each individual enzyme for maximum particle digestion and complete nutrient distribution throughout the body. Which increases the formula's bioavailability. Ultra-Enzyme Support ® includes a special feature called n•zimes PA-L™. This proprietary enzyme blend is derived from isolated plant sources, as a pancreatic enzyme alternative, to further increase the body’s ability to metabolize proteins, carbohydrates and fats. It is ideal for diets high in saturated fats. We are not promoting that you eat this every day, but just to show how powerful the enzymes in Ultra-Enzyme Support ® are. This formula is a high performance, broad-spectrum vegetarian digestive enzyme with 19 different digestive enzymes. Using the highest quality vegetarian enzymes and mineral cofactors it provides support on many levels. Many digestive enzyme products use pancreatin, trypsin and chymotrypsin, which are harvested by juicing the organs of cow and pig cadavers in slaughter houses. These animal based enzymes can encourage dependency and only work in a very narrow Ph range and are often destroyed in the stomach. This formula uses only vegetarian enzymes and is manufactured under the strictest standards for optimal function of the digestive system. Your digestive system, immune system, blood stream, liver, kidneys, spleen, and pancreas, as well as your ability to see, think, feel, and breathe, in fact, the very functioning of each and every cell in your body all depend on enzymes. So if we do not have enough our whole body will suffer. Maximized immune system: The primary vehicle the immune system uses for destroying invaders is enzymes. Supplementing can significantly improves the ability of your immune system to do its job. Ultra-Enzyme Support ® also includes enzyme activating mineral co-factors like calcium, magnesium, manganese, copper, chromium, potassium and zinc. This special proprietary blend of chelated minerals has been included to help maximize the performance of this enzyme formula. Plant-based enzymes and sources including pineapple, papaya and vegetarian based fermentation. The high pH environment of the small intestine is the only place animal-based enzymes can function, as they are extremely sensitive to low pH ranges. This means that animal based enzymes may not survive outside of this environment. Plant-based enzymes are not destroyed by the acidic conditions of the stomach and, therefore, are stable in the upper stomach where they can begin processing food immediately. Are your digestive enzymes making you mineral deficient. Remember when taking any enzyme you must have the proper minerals with it or the enzymes will deplete your body of the minerals it needs to work. In nature minerals and enzymes always coincide and work together. Check your label. We are the only Company that put a special blend of Patented Chelated minerals in all our formulas the L.E.A.D.S® Delivery System. We only use patented amino acid chelates from Albion. Albion is the world’s leader in mineral nutrition. All chelates are not created equal. Albion amino acid chelates are unique because they are, Hypoallergenic, Vegetarian friendly, clinically researched. Look for them on your label. Without realizing it, every day you eat processed, over-refined, or sterilized foods that destroy the natural balance of healthy flora in your intestines and leave little or no enzymes in your food. Any sustained heat of approximately 118-129 degrees Fahrenheit destroys virtually all enzymes. This means that, for most of us, the food entering our stomachs is severely enzyme deficient. The result is that most of our meals enter our stomachs are devoid of enzymes. The western cooked/processed diet are as much as 40 times higher than that found in people eating a more natural diet. Nature intended that we continually replenish our enzyme reserve through proper nutrition and eating habits. Unfortunately, that just doesn't happen. At this point, the pancreas and the other organs of the endocrine system are put under tremendous stress since they have to draw reserves from the entire body in order to produce massive amounts of the proper enzymes. The less digestion that takes place before food reaches the small intestine, the greater the stress placed on the endocrine systems. The bottom line is that regular supplementation with digestive enzymes takes stress off the pancreas (and the entire body) by providing the enzymes required for digestion. In other words, digestive enzyme supplements may just be one of the best insurance policies you can give your body so you can enjoy a long and healthy life. Better bowl movements no constipation and/or diarrhea. Supports digestion of dairy products. Supports better and a more complete protein digestion. Enzymes are essential nutrients for life. Helps digest food and nourish the immune system. Puts back the enzymes lost by cooking and processing foods. Protease and Peptidase; Help digest protein molecules. Four varieties of protease enzymes have been combined in this formula to compensate for higher protein diets. Amylase and Alpha-Galactosidase; Help digest simple and complex carbohydrates and starches, i.e. pastas, breads or starchy vegetables like potatoes. Glucoamylase, Invertase and Diastase; Help to digest glucose and other sugars. All three enzymes are included to insure that all natural and refined sugars are completely digested. Improperly digested sugars can lead to blood sugar imbalances. Lipase ; Help digest fats and oils. Additionally, Lipase helps your body better utilize Omega fatty acids. Cellulase and Pectinase; Help the body break down fiber compounds in order to reap its maximum health benefits. These two enzymes are helpful in bowel regulation. Phytase, Hemicellulase and Xylanase; Specifically help with releasing fiber-bound minerals from plant sources. They have been included to aid in the digestion of herbal supplements. They are also great for vegetarian diets! Supplemental DPP IV; It seems reasonable that if supplemental DPP IV and DCP 1 were ingested in conjunction with a gluten containing food, the protein could be efficiently broken down prior to the entrance into the small intestine. Lactase – Helping digest, Lactose and milk sugars. Lactase is required to break down lactose (a primary sugar found in mammalian milk). Also used to help digest yogurt, milk products and cheese. Our Capsules do not contain any, chemicals, gluten, soy, dairy, yeast also wheat free, no eggs, no preservatives, no artificial coloring or flavoring. All Natural Ingredients, Certified and in full compliance with GMP Requirements for Dietary Supplements. We also have a third party testing lab, that tests for impurities. Made in USA facility. Ultra-Enzyme Support ® should be taken with every meal. Take 1-2 capsules, depending on body weight and the size of the meal. Ultra-Enzyme Support should be taken just before, or during, meals for help with stomach related symptoms like gas, sensitive stomach, poor digestion, water retention, bloating, fatigue, etc. People suffering from gas, occasional heartburn, bloating, cramping, fatigue after eating or cravings, may expect these symptoms to diminish after just a few weeks of regularly taking this formula. Other enzyme deficiency related conditions will improve over time depending on the individual. Better bowel habits, improved mobility or normalized inflammation to name a few. You should notice significant improvement within 2-3 weeks if you are taking the formula faithfully. 1. How do I use Ultra-Enzyme Support ® properly? Ultra-Enzyme Support ® should be taken with every meal. Take 1-2 capsules, depending on body weight and the size of the meal. Ultra-Enzyme Support ® should be taken just before, or during, meals for help with stomach related symptoms like gas, sensitive stomach, poor digestion, water retention, bloating, fatigue, etc. 2. Why aren't the enzymes in this formula measured in milligrams? Enzymes are measured by reaction time, rather than by amount or weight. The unit measurements used for each enzyme refers to the length of time and the intensity of the reactions it creates. 3. Who should be taking this formula? People suffering from gas, occasional heartburn, bloating, cramping, fatigue after eating or cravings, may expect these symptoms to diminish after just a few weeks of regularly taking this formula. Other enzyme deficiency related conditions will improve over time depending on the individual. Better bowel habits, support mobility or normalized inflammation to name a few. You should notice significant improvement within 2-3 weeks if you are taking the formula faithfully. Plant-based enzymes are derived from many sources including pineapple, papaya and mushroom-based fermentation. Animal-based enzymes are extracted from the pancreatic tissue of slaughtered pigs and cows. The high pH environment of the small intestine is the only place animal-based enzymes can function, as they are extremely sensitive to low pH ranges. This means that animal based enzymes may not survive outside of this environment. Plant-based enzymes are not destroyed by the acidic conditions of the stomach and are therefore stable in the upper stomach, where they can begin processing food immediately. NWC Inc. will never use animal-based enzymes from slaughterhouses. 5. Can I take Ultra-Enzyme Support ® while I am on medication? 6. Are there side effects with Ultra-Enzyme Support ®? When taken as directed there are no known side effects with this formula. 7. Can I give Ultra-Enzyme Support ® to my kids? This formula can be safely given to children. If they have trouble swallowing pills, open the capsules and add the contents to any cold or room temperature food or beverage. Remember heat and cooking destroys enzymes. We also recommend our fruit flavored Belly-Ease chewable for childern who can chew a tablet. 8. I have been using the enzymes for a while but I still have excess gas. What causes this? With excess gas, digestive enzymes are the first line of defense, but well digested food is only half the issue. A good intestinal environment balanced with probiotics is essential to good digestion and the elimination of excess gas. We recommend Pro-Biotics Plus® stick packs or Pro-Biotics Plus® capsule. 9. What is the importance of L.E.A.D.S. ® Live Enzyme Activated Delivery System ®? The L.E.A.D.S. 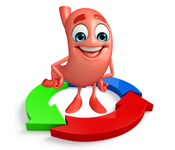 ® SYSTEM supplies all the enzymes and cofactors necessary to enhance digestion and delivery. Other formulas not utilizing L.E.A.D.S. ® will strip minerals and other nutrients from the body in their effort to activate the enzymes. Without L.E.A.D.S. ® the formula will not be as effective.